To sell either new or used vehicles in California, or to act as a broker or wholesaler, you will need to get a dealer license. Dealer licenses are issued by the state Department of Motor Vehicles. To get licensed you need to comply with the specific requirements for the license you want to get. These may include complying with specific location requirements, passing an education course and exam, and obtaining an auto dealer bond. 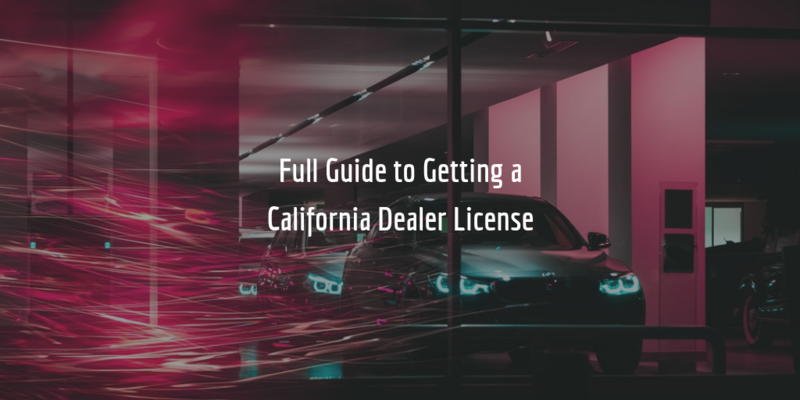 See below for a step-by-step guide on applying for your California dealer license. The licensing process for these dealers is fairly similar, though there are some conditions that only apply to some of them. Before you can apply for your license at the California DMV you must register your business in the state. Once you’ve completed these steps, you can proceed with applying for your license. The application process for any of the four main dealer license types is comprised of completing the application forms packet in full and complying with the additional requirements. These packets include the majority of forms you will be required to complete as part of your application process. On top of completing these, you will need to provide several other documents and comply with location and photograph requirements. See the next section. Compliance with all of the above must be properly photographed and attached to your application forms packet. You can find the full details of what kinds of photographs you need to take at the Occupational Licensing Photograph Requirements page. On top of the above, California used and wholesale dealer license applicants must also comply with two further requirements. Applicants for both these license types need to pass an education course with a DMV-approved education provider. Once they have passed the course, such applicants also need to pass a test with one of their local inspectors. Finally, dealers also need to have an inspection conducted at their dealership as part of the application. Contact your local inspector from the link above to learn more about the inspection and schedule one. Obtaining a surety bond is also an important part of the licensing process for new, used, and wholesale dealers in California. New and used dealers need to obtain a $50,000 bond, whereas wholesale dealers require a $10,000 bond. This bond is required to guarantee dealers’ compliance with Section 11710 of the California Vehicle Code. The cost of getting bonded is not the same as the bond amount. The surety that issues the bond examines a dealer’s personal credit score, along with other financial factors, to set a rate at which they can get bonded. Typically, the better your credit score, the lower your rate will be. You can get a quick and easy estimate of the cost of your bond by using our bond calculator below. All dealer licenses in California are renewed annually. You will be notified by the DMV 90 in advance that your license will be expiring. You will then need to complete form OL 45, along with several other forms which are specified in the renewal application itself. If you have any questions about the California dealer license application process, make sure to contact the DMV for more information. If you would like to know more about the bond for California auto dealers, contact us at 877.514.5146 anytime!